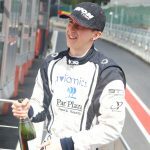 Sunshine, champagne and smiles came early this year for Ben Tuck as he raced his way to two 3rd place finishes at a sun kissed Snetterton circuit in Norfolk at the weekend. Under the warm spring sunshine, the Sandy based 20 year old kicked off his second season in the Caterham Supersport Championship by maintaining his run of form from the end of 2016, making it 6 consecutive races in on the podium. The result was a solid start for the former RSF MSA Young Driver of the Year, who has been tipped as a title challenger this year after a dominant performance at the end of last season. “We’ll be making sure that everything is spot on for the next round at Spa” he said. Ben has a strong history at the legendary Ardennes circuit, having visited in 2015 as a guest entry in a Mazda MX-5 where he claimed a class win and fastest lap. The Snetterton result is sweeter as it comes right after the announcement that Park Plaza Hotels and Resorts are to be continuing to partner Ben for the 2017 season. “We’re really proud to be working with Park Plaza, and since they have been with us we’ve never been off the podium so it must be a good relationship!” commented Ben. As he continues to impress in Caterhams, Ben is also hoping to dovetail some GT Cup duties this year as he eyes a move to GT4 in 2018.